Christianity Today magazine online recently posted a troubling essay titled "The Craziest Statistic You'll Read About North American Missions." The essay by Abby Stalker draws upon the research of the Center for the Study of Global Christianity as it relates to the high number of Christians in North America who do not know any no-Christians. 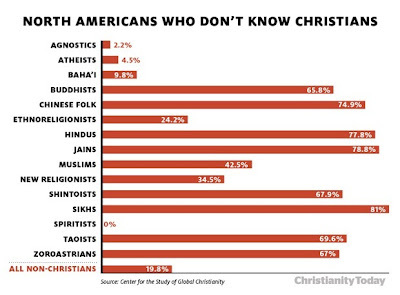 The first sentence of the article summarizes this is by saying, "One out of five non-Christians in North America doesn't know any Christians." The perspective of that sentence should perhaps have come at the topic from the other direction, which is more in keeping with the thrust of the rest of the article by saying, "Many Christians in North America don't know any non-Christians." CSGC research associate Gina Bellofatto said identifying contact between Christians and non-Christians based on location, age, and gender is "on her list" for further research. In the meantime, she notes that burgeoning movements have arisen to initiate purposeful interreligious dialogue and community service projects. They're still rare compared to the apparent apathy among Christians about befriending non-Christians, especially if it means reaching across neighborhoods and towns into more ethnic enclaves. "I don't know how many more million Muslims, Hindus, Buddhists, and Jews need to come to this country before it becomes a priority," she said.